Enter a mysterious lab and create potions that could bring you magical wins in this 5-reel, 23-payline slot machine by Thunderkick! Frogs have been used in magic spells and witchery for ages. With a little knowledge of alchemistry and, perhaps, a little magic you will create pure gold while spinning the reels of this enchanting game with Dropping Symbols, Multipliers and Mystery Games! 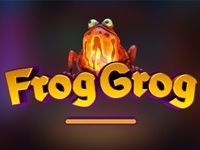 Frog Grog has a funny sounding name with a fiery toad in its logo but gameplay that is hard to match. The game has dropping symbols that will disappear with new symbols dropping into place to create new pays. There are also wilds, multipliers and a mystery game! Dropping Symbols: Symbols included in payline wins get replaced with new symbols giving you the chance for even more wins! Multiplier The Multiplier increases one step each time new symbols are dropped in. After the Mystery Game has ended, the Multiplier increases one step for each win during the Mystery Game. The first step of the increasing multiplier ladder starts with x1 and then climbs one by one up to x7! Wild Frog The Wild Frog symbol substitutes for any other symbol in the game. After presenting all payline wins the frog will remove all symbols on the same row and reel (except other frogs), it will then remain for the rest of the game round or until it is part of a winning combination. The Mystery Game can trigger randomly on any non-winning spin. The Mystery Game removes all symbols except the Moth, the Flower and the Frog. Symbols removed award regular payline wins according to the paytable. Betsafe Casino - Deposit €97 play with €20% match €. The Amazing Spider-Man - Bonus Feature 25 Line Slot from Party Gaming. Bangkok Nights - Bonus Feature 25 Line Slot from WGS. Jurassic Slots - Bonus Feature 25 Line Slot from WGS.